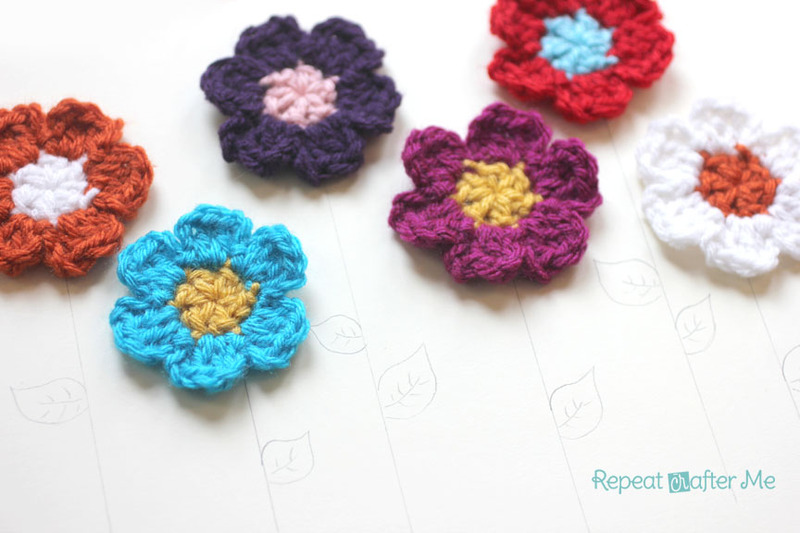 Spring is just around the corner and its a great time to start crocheting for the new season! I came with a simple little spring flower pattern that I think you will like. It starts with the Magic Ring which a lot of you frequently ask me about. There is a wonderful tutorial on how to make a magic ring over at Petals to Picots blog. You can find the tutorial HERE. I decided to change colors to make the middle a different color, but you could crochet this entire pattern in one color and add a colorful button to make the center as well. Magic Ring, chain 2 in ring, make 6 DC in ring, pull tight (change color if you wish) join to first DC, chain 3. Round 2: 2 DC in same stitch as your chain 3, Chain 3 and slip stitch in the same stitch as your first chain 3 and 2 DC’s, Chain 3, 2 DC in next stitch, Chain 3 and sl st in same stitch, repeat around. So you should have *Chain 3, 2 DC, Chain 3* in each stitch all the way around making 6 petals. Fasten off and weave in all ends but one long one to sew onto your hat, purse, or other project. Looking forward to seeing how you use your spring flowers! 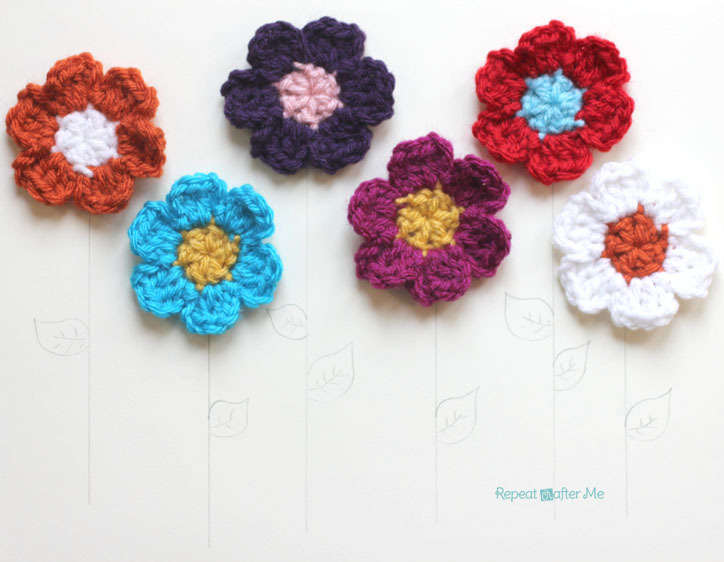 I have created a video tutorial on how to crochet this flower! It really is simple 🙂 I hope this helps any of you who may be confused by the way I wrote the pattern. These are precious! Love your patterns, these will look so cute on my girls Easter Dresses or in their hair! Thank you! How cute would it be to make a "Field of Flowers" blanket with these?! MY NEXT PROJECT – THANK YOU!! You are absolutely the best!! I have enjoyed every pattern you have posted!! What do you mean by "chain 2 in ring"? I have a big project on the go and these are brilliant to go with it. Thanks. Also like to say I have made the owl and sock monkey hats and the hidden seam is brilliant. I am using the technique for a hat for me! Love your blog. I've found your blog these days and I just can't stop reading. I'm always searching for new projects in crochet but it's difficult to find recipes so well explained as yours. Thank you for that, I really admire you. I'm from Brasil and I was thinking about translate some of yours patterns and post them, so more portuguese-speaking people could know your work. What do you think about that? Of course I would give you all the credits. I watched the video of this and you crochet so fast it's crazy! I wish I could crochet that fast! Yes, of course, Spring is certainly a great excuse for crocheting! Funny enough, a neighbor was cleaning out her son's closet (we're all starting the Passover cleaning around here…..) and found about seven small skeins of creme 100% Aran wool……of course she thought of me, and I was so thrilled to get the wool, which I could never buy anywhere near here…..plus she had no idea what it was, and it's vintage USA, so wondering where her son got it…..now just have to think about how to use it, I'm thinking home decorating! Almost forgot with the babble, thanks for sharing on craft schooling Sunday! I just found your blog and love it. I've a very cute 3-years-old niece. She is the only one niece in my family and so crazy of Minnie. I'll try to crochet Minnie's hat for her. Thank you for the Minnie's pattern. make it clever. I am inspired to exchange creative concepts and critical information with you. Your website is certainly one of the better blogs online right now. I just whipped up two of these tonight and they are so cute! I am already planning on making more. I love all your tutorials and just wanted to thank you for taking the time to write them. I have a blog too, and I know how time consuming writing this kind of thing can be, but everything I've made from your directions has turned out fabulous and they are so simple! I'm almost convinced that I can make those owls….but I just taught myself to crochet in November, so I'm trying to take it slowly. I want yo thank you for every pattern you have shown us! I enjoyed each tutorial! Thanks! I just spent three days and two nights in the hospital with my hubbie. I was so duuuumb not to bring a crochet project to pass the time and keep my mind. These would have been perfect. This would make a cute addition to a hospital care package. Greetings from Georgia on this cool day! Thank you so much for leaving this pattern up for those of us just now finding your page!!! Order flowers online with Same Day Delivery from Floral Fuzion in Applecross . Fast, hand delivery to applecross florist and surrounding areas. Loved the video, but it was way too fast for me to follow. You are very talented and have obviously had a lot of practice. Next time can you please do each move more slowly so us newbies can follow along without being overwhelmed? viewers to go to see the website, that’s what this site is providing. I am so excited about this idea! I have been looking for items for a fundraising booth to benefit my literacy project and this is perfect! Very inexpensive to make and so cute!